A wrestler named O'Nami, "Great Waves", was immensely strong and highly skilled in his chosen art. In private his skill was unmatchable - he defeated even his own teacher. And yet in public demonstrations, ordinary laymen could throw him without difficulty. "Great Waves is your name", said the master, "so stay in this temple tonight and listen to the sound of the sea. Imagine you are those waves, forget you are a wrestler and become those huge waves sweeping everything before them." O'Nami remained. He meditated all night on those waves - it wasn't easy though, he had distractions, unnerving thoughts interrupting his composure. But in time he prevailed with this exercise, and by morning he realized a new found vibrancy. 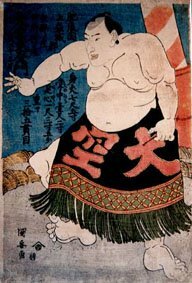 That day, he entered a public wrestling tournament and won every bout, and from that day on, no one in Japan could ever defeat him. When practicing martial arts, don't be the artist; become the art. Try the standing practice (Zhan Zhaung, in Chinese; or Ritsuzen in Japanese). It gets right to the heart of the matter. Try standing until you fall down. Oh WOW! What an awesme post!!! I can totally understand every concept presented here because I went through the same path as I travelled through the Way of Martial arts. That self-consciousness, and fear of making a mistake actually created mistakes.. it wasn't until I was willing to just "DO" regardless of how right it was that I was able to avoid making mistakes. I remember Seeing a goju demonstration with a member doing a lot of kata. He truly had become the art. It was a beautiful thing to see. There's a beautiful link to do with this post and the one about legends you posted a while ago. It's a perfect example of how useful they can be in motivating a person. One way my first sensei got us past the fear of mistakes was to line the whole class up and show us a complicated technique (A flying spinning back-kick, for example. ), and then have everybody in the class give it one shot, in order, highest to lowest. People usually started screwing up in the upper-to-middle belts, so by the time the lower belts attempted it, all fear of looking excessively silly was usually out the window. By the time we got to the middle belts ourselves, we had pretty much gotten over the idea that something was wrong with screwing stuff up. It's a lesson that's stood me in good stead ever since. I firmly believe that the process will eventually overcome this when practiced, practiced, and practiced some more. Banzai! Stand until I fall down? Ritsuzen sounds pretty rough, I think I'll just stick with my sitting practice for now! Thank you. Haven't we all gone down that path? What's striking is that most people think they're the only ones going through this. Thanks, Mat. Actually, it was kata that I originally had in mind for this post. Whether you're observing or performing great art of any kind, one gets "caught up" in it, becomes one with it, etc. And I'd like to bet that many of you had a pretty good laugh over this. This was an excellent ploy by your Sensei to get his people to "lighten up" and see how we're all in the same boat most of the time. Good story. Well, practice does make perfect. And even if it's not perfect, that's ok.
Small dojang means less distractions. This means when training at Master's dojang where he has 20 - 30 people I often fall appart on my forms. Same goes for tourneys. A group of us once trained for a group form at a competition. We trained harder than anyone else on our level, staying late or coming early after class to do it. We trained and trained and trained. The competition came . . . and we fell apart. Spectacularly. Even bumping into each other. My finest recollection of it is ending the form with my nose about a centimetre away from the back of the person in front of me, who was facing in the wrong direction anyway! The lesson? We learned to laugh at ourselves. We'd been taking it very seriously up to that point and had probably grown a little arrogant. So, it taught us humility. It also taught us that we weren't quite where we thought we were in our training. I heard a Sifu once say that your true measure as a Martial Artist is not how you perform when you are feeling at your best, but how you perform when you are feeling at your worst. How you cope with the mistakes you make. This post reminded me of the question from the TS Elliot poem - 'How do you tell the dancer from the dance?' As you say, the answer is simple. You can't. Heh - kfg, your sifu sounds much like my voice teacher. To wit "Anybody can sing wonderfully when everything goes right. A professional sings wonderfully when everything goes wrong." She was a big believer in practicing under any possible condition. Inside, outside, smokey, in weird positions, you name it. I thought she was very strange - until the day a fan blew my accompanist's music under the piano mid-performance. She kept playing, I dove for the music, neither of us missed a beat. First standing ovation I ever got - singing on my hands and knees, under a piano, grabbing music. Definitely a good point. I can totally relate to it, even still. I know that at graduations/testing and during tournaments, everything I've done well goes out the window, seemingly. I mean, I hold my own, but somehow I do much better when amongst "my own people" at the do-jahng than out competing against others, or when many eyes are on me when it's critical to do well. I guess it's like stage fright. Maybe you never quite get over, but you can learn how to better deal with it, like O-nami did. I've never attended a large school. I'm with you, smaller schools provide a better opportunity for learning. One of the trademarks of being sane, mature, and happy is the ability to laugh at yourself. Some people, especially martial artists, take themselves and everything so seriously, and that's really a shame. Thank you for sharing that story here KFG, it had the right ending to it. An instructor of mine once said that anyone who goes out to compete is already a winner. "Stage fright" -- I like that! My instructor was just talking about this last week: becoming the kata, and not thinking about every move and whether or not it's right. I think confidence issues come and go many times throughout training. Sometimes I've got it, and other times I really don't. Merging with your activity goes beyond confidence. Confidence can be gained and lost. There was a famous ballet dancer - Vaslav Nijinsky - when he performed he would take these incredible leaps through the air. When he would descend, he floated down like a feather. "How do you do these impossible moves? ", people would ask. The more he thought about it, the more difficult it became to execute these superhuman feats. Thinking got in his way. He eventually figured it out though. Perpetual Beginner, I loved your story. I'm so glad that never happened to me when I was singing. Thinking does get in the way. It's easier not to think at all and rely on muscle memory. I remember my first time on the mat and I was filled with aprehention. Would I look stupid? Make mistakes? etc. Our karate school is great for making the new student feel comfortable and all us students go out of our way to see that they are. After all...we remember what it was like. "Lose yourelf in the practice, the patience" and yes, Mat, LIVE in the kata and become the art! I really need to brush up on my French, because that would make an awesome motto. Congrats on yet another great post John, hopefully you won't blow out your knee saying the full version of OSU! I remember too. One school I used to train at had a very nice policy: All the seniors in the school would introduce themselves to the new student one by one and then take turns showing her/him some kind of technique.